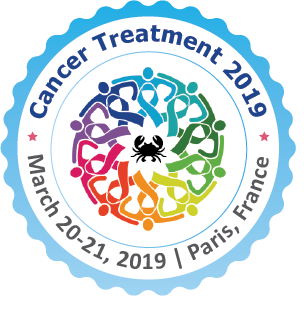 We welcome all the Oncologists and Cancer Researchers around the world to attend the "2nd International Conference on Cancer Diagnosis and Treatment" going to be held in Paris, France from March 20-21, 2019. Cancer Diagnosis and Treatment conference 2019 will acts as a forum for Directors, Professors, Researchers, Oncologists, Cancer Specialist, Students, Foundation Leaders, Industrial Professional, Statisticians, Clinicians, Academicians, Medical Oncologists and others from all over the world to share their values knowledge and experience about the Cancer research, to stimulate Young Researcher on new ideas for treatment and analyses of the current market and for the future direction in cancer vaccine, instrument with less side effect of therapy. Cancer Diagnosis and Treatment Conference 2019 involved with many interactive sessions on cancer detection, therapies, control, prevention, advancements in the oncology, posters, symposia, workshops, panel discussion, industry presentation, exhibition, Young Researcher Forums(YRF). With people from around the world focused on getting some answers concerning Cancer Diagnosis and Treatment, this is your single most obvious opportunity to achieve the greatest accumulation of individuals from the mending focuses, Universities, bunch, etc. This Cancer Diagnosis & Treatment conference in 2019 will coordinate appears, disperse information, and meet with recurring pattern and potential investigators and get name affirmation at this 2-day event. Symposia/ workshop, B2B and interaction session. Radiation therapy uses great energy element or radiation or waves such as x-rays, gamma rays, electron beams, protons to abolish or shrink Cancer cell. When compared to normal cell, the Cancer cells grow and split faster, radiation works by making minor breaks in the DNA inside the cells. Cancer cells whose DNA is damaged by radiation stops dividing or die. The normal cell current nearby Cancer cells can also be affected by radiation, leading to side effects. Radiation therapy may be used alone or in combination with surgery Immunotherapy and Chemotherapy. The radiation can be given in 3 ways dependent upon the type of Cancer and position. Types of radiation are external radiation, internal radiation, systemic radiation and others. Cancer Imaging is the term that covers many methods used in diagnoses and Research Cancer. It is initially used to diagnose and stage the disease and now it is also used to assist with surgery and Radiotherapy, to recognise patients who are responding to treatment and to look for early responses. Imaging tests: X-ray, PET, CT, MRI, Mammography, ultrasound etc. Targeted Cancer Therapy is one of the chief means of medical treatment for Cancer. Targeted Therapy blocks the development of Cancer cells by interfering with Specific Targeted Molecules required for carcinogenesis and tumor growth rather than by simply interfering with all rapidly dividing cells. Targeted Cancer Therapies are likely to be more effective than older forms of treatments and less harmful to normal cells. Numerous Targeted Therapies are examples of immunotherapy using immune mechanisms for therapeutic purposes developed by the field of cancer immunology. So, as immunomodulators, they are one type of biological response modifiers. Types of targeted therapies: hormone therapies, signal transduction inhibitors, expression modulators, apoptosis inducers, angiogenesis inhibitors, toxin delivery molecules etc. Cancer control is intended to decrease the Cancer cases, death and cause in the behavioral, social, population sciences to generate intervention, research in the biomedical instrumentation, morbidity, and mortality to progress the quality of life. Palliative care is a special method for specialized medical and nursing care for individual with life-limiting or bed ridden sickness. Palliative care is also termed as comfort care, supportive care and system management to inhibit or treat diseases. Different types of Palliative care are given to the patient liable upon the emotional issues of Cancer and by addressing the side effects. A term for diseases in which abnormal cells divide without control and can attack nearby tissues. Cancer cells can also spread to new parts of the body through the blood and lymph systems. There are numerous main types of cancer. Carcinoma is a cancer that originates in the skin or in tissues that line or cover interior organs. Sarcoma is a cancer that originates in bone, cartilage, fat, muscle, blood vessels, or other connective or supportive tissue. Leukemia is a cancer that starts in blood-forming tissue, such as the bone marrow, and causes large amounts of abnormal blood cells to be produced and enter the blood. Lymphoma and multiple myeloma are cancers that arise in the cells of the immune system. Central nervous system cancers are cancers that arise in the tissues of the brain and spinal cord they are also called malignancy. Medication conveyance refers to plans, approaches, advances, and frameworks for carrying a pharmaceutical compound in the body as estimated to securely achieve its desired curative effect. It might contain logical site-focusing inside the body, or it may include encouraging fundamental pharmacokinetics; regardless, it is commonly worried about both amount and length of medication nearness. Medication conveyance is commonly drawn closer by means of a medication's synthetic definition; however it might likewise include medicinal devices or medication device mix items. Medication conveyance is an idea strongly coordinated with measurement shape and course of organization, the last here and there being considered piece of the definition. Drug delivery technologies alter drug release profile, absorption, distribution and elimination for the benefit of improving product efficacy and safety, as well as patient convenience and compliance. Cancer can be treated by many methods, such as surgery, chemotherapy, radiation therapy, targeted therapy, hormonal therapy, and synthetic lethality. People suffering from cancer can be examined through medical tests. These generally include blood tests are X-rays, CT scans, and endoscopy. The tissue investigation from the biopsy specifies the type of cell that multiplies, through its histological grade, genetic abnormalities, and other features. Thus all together it gives the user information about molecular changes such as mutations, fusion genes, and numerical chromosome to estimate or show the prognosis and to choose the best treatment. Cytogenetics and immunohistochemistry are other common tissue tests. The elimination of cancer without damaging the other parts of the body (by achieving cure with near-zero adverse effects) is the key goal of treatment. The type of treatment depends on the type of cancer the patient is suffering with and how advanced it is. Various people with cancer have only one type of treatment. But for maximum of the people, they have a combination of treatments, such as surgery with chemotherapy (use of drugs to kill cancer cells) or radiation therapy. Immunotherapy, targeted therapy, or hormone therapy are alternative kind of treatment for cancer. Drug discovery and development together are the complete practice of identifying a new drug and passing it to market. Discovery might include screening of chemical libraries, identification of the active ingredient from a natural remedy or design resulting from an understanding of the target.